There is a real confidence within the group at the moment. I think Benetton over the last couple of months have been playing some really good footy so the only thing we can do is take the confidence into this Italy side. There are a lot of us here who know each other really well so hopefully those combinations also pay off when we get on to the field! We know it’s going to be a tough Six Nations. It is always tough when you are playing against some of the top teams in the world. We know what level we are at, but we also believe in the journey we are on so it is about making that gap between us and the rest of the nations smaller. We want to surprise a few people for sure. We know what threat they are going to pose. They are really handy side. They have good forwards and it is always going to be a physical battle up front, but they have got players who can throw the ball around like Adam Hastings, Finn Russell, Huw Jones…these guys are all top players. We are focusing on ourselves and we’re excited. When I was growing up as a boy, you looked at Scotland as a nation that wasn’t quite there, but now, they are really thriving. Credit to them and credit to their club system and all the players that are coming through there. For us, we are confident in the journey that we are on as a nation and we’re just looking forward to the challenge. I played at Murrayfield against Edinburgh and I am sure it is going to be a completely different atmosphere. I have been speaking to a few of the experienced boys like Sergio [Parisse] to ask what it is like and apparently it is an incredible experience. For me it will be another surreal opportunity and a dream for me to play in atmosphere and a venue like this. Mum and Dad are flying over so that will make it extra special to have some family there. I’m getting goosebumps now, but hopefully I can do the best I can in such an iconic stadium. We have a great opportunity against Scotland. If you look at our performance at the back end of the last Six Nations against Scotland at home, we were in the game for 75 minutes. We believed that we should have won and got over the line in that game, but we have got another opportunity this weekend to right the wrongs from the last time we played against them. We are not going there just to show up. I do think we are a completely different side to last year and a few years ago. All of us have got a lot more experience and the training intensity has increased. We are moving in the right direction and we can only take confidence from the last time we played against Scotland. We gave them a bit of a fright! We are going there to put our foot down and make a challenge of the game and hopefully nick a result. In the back of all our heads, and not just us, the long-term version will be the World Cup. This [the Six Nations] is a perfect opportunity and platform to try create some confidence and build something. However, we take one game at a time and the Six Nations is a big tournament for everyone and it is a big opportunity for all of us to put our hands. 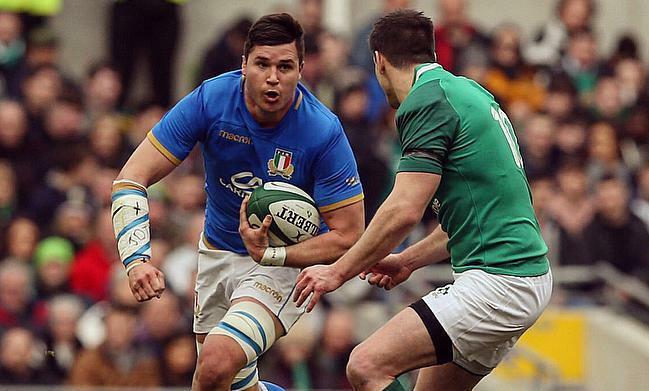 It is always a dream and a massive honour to put on the Italy shirt. I know it is not going to be easy. Last year was sort of a breakthrough for me in the Six Nations so I know that it is going to me more difficult this time around. Playing against some of the best back-rows and playing alongside the likes of Sergio is exciting. I just want to enjoy it and give it everything that I have got.